The Teach-Off feels like something that happened a decade ago. As intense as it was when it was taking place, the end of it has suddenly left a gap in my life. It has taken some time for me to compile these results (thank you for your patience) and in the spirit of full disclosure, here are the answers to the questionnaires that we carried out. I have left out the description and the rationale behind the research methodology (which will be published in an article elsewhere), but suffice to say that this piece of research is purely qualitative and seeks to obtain as full a description of experiences and perceptions of their Dogme and coursebook-based lessons as possible. I have also avoided drawing any conclusions as yet because I was hoping that you the reader might formulate your own conclusions as you read this. If so, please do contribute in the comments section. The following student questionnaire was given out to students twice. Once at the end of 2 weeks of Dogme lessons, and again at the end of two weeks of the Coursebook-based lessons. 1. The course was well-organised. 2. The teacher was well-prepared. 3. The topics were interesting. 4. The language covered was useful and easy to understand. 5. I felt motivated to learn and to speak English. 6. I learned a lot of new things on this course. 7. I am happy with the progress I made in this course. 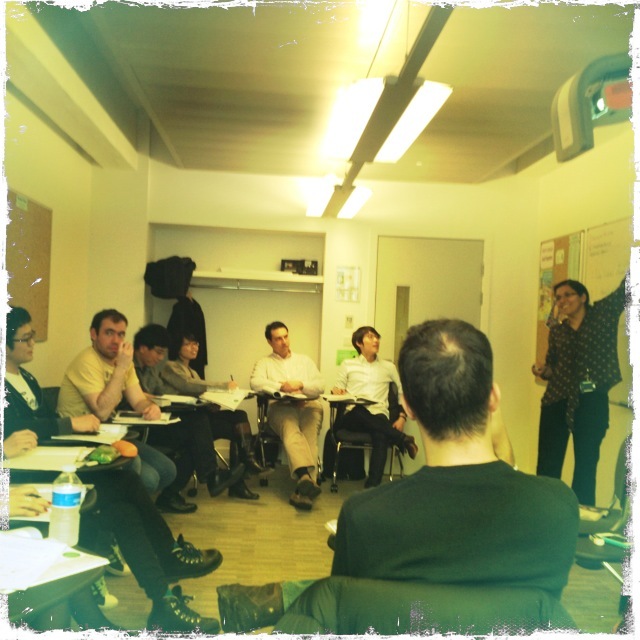 There were 9 respondents to the 2 weeks of Dogme lessons, and 10 respondents to the 2 weeks of coursebook lessons. 2 out of the 10 were new students that were not present during the Dogme phase. Although these numbers are not enough for the qualitative data to be in any way statistically reliable, here are the answers to the above questionnaire. More importantly, the qualitative data from the comments that students wrote to the questions provided a more in depth description of how they perceived their experience with both Dogme and the coursebook. How was it different from your previous learning experience? What do you think the teacher could do differently to help you learn more? It seems as if many of the response to the following question after the ‘coursebook phase’ of the course were directed either at both teachers, or focused on the communicative element of the teaching methodology, rather than the ‘coursebook’ element of the course. Please write a few comments on how you feel about this style of lesson. From the answers to those questions, it seems that although it is easy to compare the maverick Dogme lesson to the learners’ previous learning experiences and for them to comment on this methodology and style of learning, the same questions asked regarding a coursebook lesson might get less-focused answers since the use of course books might not necessarily be anything new for the students. Thus, many answers tended to be about the teaching style and the communicative approach to teaching. In order to get students comparing the two methods in a more focused way, we gave out another questionnaire, encouraging a comparative analysis. There were 7 respondents, all of whom were present for both the Dogme and the coursebook phases. If you find that the total for any of the questions do not add up to 7, it is due to some questions not being answered. (b) without the coursebook 0/7. 13. Are some coursebooks better for you than others? So, what do you make of these findings? During this entire Teach-Off, we’ve decided to implement a open-door policy in which any teacher who wanted to watch the class could walk in at any time. As a result, we’ve had Shelly Terrell, Adam Beale, Emi Slater, several of colleagues at IH, and my DOS, Varinder, who will be teaching the coursebook lessons in the second half of this teach-off, come watch the class unfold. Emi Slater sat in with me for the whole three hours, from 9am to 12noon, when I did one of my Dogme lesson and kindly wrote a guest post on what she saw. Last week, on the day I taught my coursebook lesson, the day Varinder taught her Dogme lesson, and Varinder’s Coursebook Day 7, Emi came to watch us on all three days in the spirit of fairness. This is Emi Slater’s account of what she saw last week. Observation of Chia and Varinder’s Teach Off. May 1st, 2nd and 3rd 2012. Well I’ve had a fascinating week. As I’ve already said, this kind of teaching “experiment” should surely be undertaken more often if we are ever going to develop more quality teaching and adapt to the ever-changing needs of our students. The language that was English is not the same as it was when the first course book was written or the first CELTA was taught – our teaching methods must surely reflect that. It is testament to Chia and Varinder’s determination and enthusiasm (no, they don’t pay me to say these things) that they have undertaken this project off their own back and it is exciting that it has been able to take place at International House. It reflects very well on IH – making them seem at the cutting edge of teaching research. And I am so jealous of their wheeley chairs! I should remind everyone at this juncture that I am, you might have guessed, totally biased. I make no apologies for this and I cannot attempt to be very objective when I just have a feeling about Dogme that is instinctive. It is difficult to intellectually justify anything about teaching methodology when there is always someone who will come back and say “no, but I must disagree, if you look at the research here … “ Of course if can be said that there hasn’t been enough research done on Dogme yet to justify teaching in this way. Perhaps not, but there certainly has been plenty of research done on SLA, and so much of it leads towards Dogme. All I can say is it feels right to me, and as I have said before, if it feels right, do it! So with this in mind I will attempt to summarize what I saw this week and last. I watched four lessons – one of which I have already described on this blog. This week I saw one with Chia teaching with the course book, one with Varinder teaching without the course book and one with Varinder teaching with the course book. So including last week’s lessons, I have watched both teachers teaching 2 lessons each (one with and one without the course book) – does that make sense? The students involved in this project have been, from what I have observed, incredibly motivated and involved in it. Many managers and DOSes’ are afraid that if students are paying (yes we know, loads of money) then it is almost “dangerous” to expect them to take part in what amounts to an experiment. In this case, the students seem to really enjoy being part of it, making jokes about course books and no course books, etc and rising to the challenge incredibly well. They are, by agreeing to this, taking more control over their own learning. It is their response at the end after all which will tell us all how effective the project has been. I think it is patronizing to assume that students can’t be involved in decisions made about how they are taught and it is fantastic how involved they are in this. It is further developing learner autonomy and is indeed Jim Scrivener’s High Demand ELT, is it not? It is impossible to avoid the fact that teaching is such a personal thing. Teaching is a group of people in a room with one person facilitating the actions of the rest. In whatever way the learning that takes place depends on the students. The environment created to facilitate that learning depends on the teacher. Either way, it is personal – very. So it is very hard to separate “techniques” and “styles” of teaching, and even methodology, when at the end of the day, for me, it all depends if the students are inspired or not. Some would say motivated but I would say the really good learning takes place when the students are inspired, and inspiration usually involves imagination. Anyone who saw Nick Bilborough talk at the Cambridge University Press Day in London last Saturday will agree that it is very hard not to link memory (or language retention) with imagination. Neurobiologists are researching this as I write. So there we have it, perhaps you can’t remember anything without using your imagination. Indeed it is very hard not to link creativity with learning overall (Chaz Pugliese). So the point is creativity must be a large part of good teaching also. Conversation is an art form, so much so that we teach our students speaking skills in order for them to get better at it. But do we teach our teachers conversation skills? Surely with or without a course book, conversation will always take up a large part of any language class, by definition. Our teachers therefore should be highly skilled at keeping a conversation going, asking follow up questions, back channelling, showing interest, turn-taking, fillers and so on. Any teacher needs to be highly skilled at the art of conversation. In a Dogme class this comes across even more because there is nothing – no book, or list of speaking questions in the book, to fall back on. Without these skills, a Dogme class will not work. During my observations this week, the teacher who asked “Why?”, leading open questions, pushed the students to justify their answers, showed interest in the students’ answers when they did speak, and generally appeared curious to know how the students felt about things was the more successful Dogme teacher. Exploiting opportunities for conversation is key to a good Dogme class and when Chia was teaching with the course book, she did this noticeably less than in the “no course book” lesson. In the “book” lesson, she quite often missed opportunities to reformulate student’s language, missing giving them opportunities to practise the target language. I think this was because she was too busy checking that the student’s were on task doing “book” activities. It felt as if she was distracted by the book. In the “non book” lesson she seemed to be paying much more close attention to students and seemed more able to really listen and scaffold and reformulate their language. She didn’t feel as present generally in the “book” class and did noticeably less monitoring. There were a number of moments in her class when she had to resist exploiting potential Dogme moments by bringing us back to the book. For example, there was a great moment when the students (in relation to the topic in the book about doctoring and manipulating photographs) started talking about Tom Cruise, Princess Diana, Hitler and a famous old model in Brazil who have all been photoshopped for different reasons. They were using examples relevant to them but Chia had to bring the conversation back to Abraham Lincoln because the reading and the following grammar exercises in the book were related to him and Stalin. None of them particularly related to Lincoln but talk about Lincoln we must – it’s in the book! 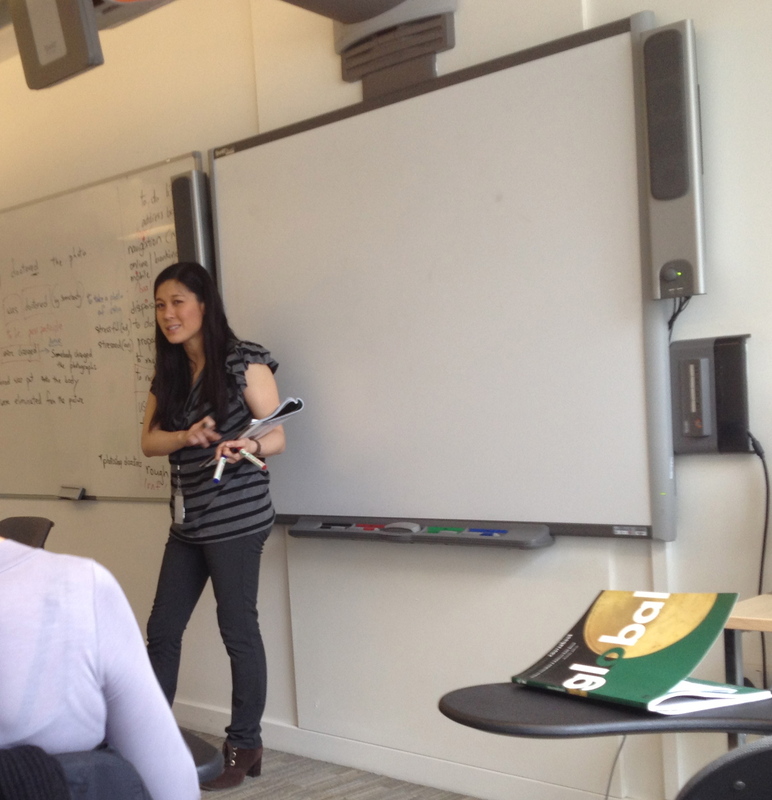 It must be said that the first of Chia’s “non book” classes that I watched was a much smaller class. Perhaps for this reason and no other, she was able to monitor more closely and perhaps for this reason and no other, it felt like the conversation flowed so much more easily than in her “book” class. Perhaps it was nothing to do with book or non-book. In Chia’s “book” class a lot of time was spent by Chia trying to create contexts for the lexis that was in the book. With Dogme, this context would have already been created and therefore the teacher can focus on reformulating or supporting the students in other ways. 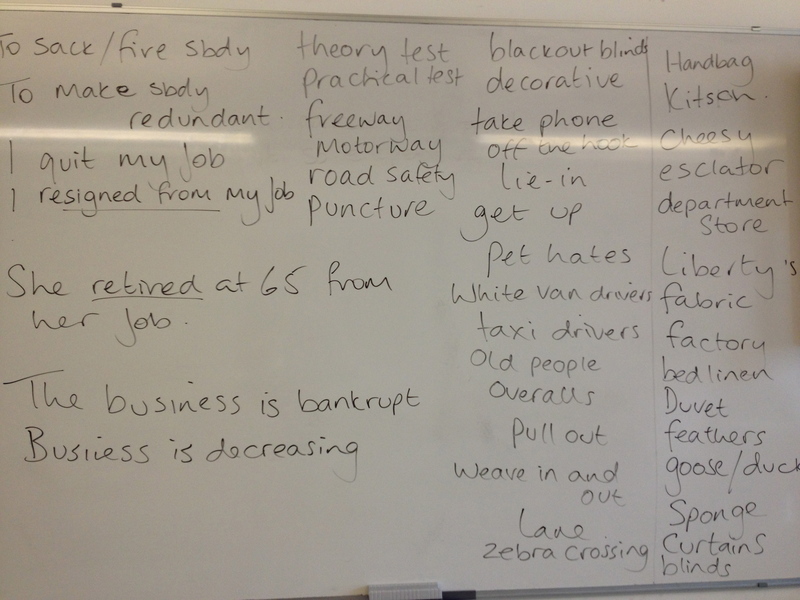 In Varinder’s “non- book” class, there was a lot of time spent on creating contexts for phrases connected to bad driving leading to some lexis about White Van drivers in London. With Dogme, the contexts have been created by the students so there is less danger that they will not relate to them. Of course, it is always the case that what is relevant for one student will not be relevant to another in the same way that what is relevant for the teacher may not always be relevant to the students. Likewise, what is relevant in the book to some may not be relevant to others. In a conversation driven lesson, the teacher can use the art of conversation to swiftly move away from a topic that is not interesting or relevant to all the students. This is easier in a Dogme lesson than in a course book lesson because in course books, the topics last for a whole unit and are often (not always) interlinked with the grammar focus and so on. If you are a student and you are not interested in the topic then too bad. In both Varinder and Chia’s “non-book” lessons, the range of topics, and therefore lexis discussed, was much wider than in both their “book” lessons, creating a much bigger chance of engaging a larger selection of students. I think both lessons covered at least four different topics – is this by definition not more useful for the students? Chia has already commented that students who are used to learning with books and in a very linear way are more likely to say “I’m finished” when they get to the end of a task and not push themselves to speak further. Without a book, this problem is taken away. Chia told me in the break of her “book” class that she stopped the students talking a few times because they were “going off task” and talking about something else. Varinder also in her “book” class told the students to stop talking because they had “started talking about something else”. Take the book away and you don’t have that problem! I could almost see the students grappling with “tasks” rather than the actual language during both “book” lessons. Does this mean that very cognitively engaging tasks are not always the best way to acquire language? With a book the teacher spends a lot of time up in the teachers room working out themselves how to do tasks in coursebooks. They then need to make sure the students know how to do the task. This is all very time consuming and is not about the target language but how to do tasks. Take the book away, and you can focus on the language itself or do tasks that lead naturally on and so have a context for the students. It is also interesting to note that the sentences that the students wrote in the “book” classes were often not true. Is this because learners really don’t like sharing true things about themselves or is it because in a typical “make a sentence” exercise (Check out Paul Seeligson on this). it does not occur to students that if they write a sentence which is true, they may be more likely to remember it? Nick Bilborough would say that actually the more unrealistic and crazy the sentence is the more memorable it will be. Either way, I would venture that in a Dogme class, you are more likely to get memorable language and contexts from students and very often they are very happy to share things about themselves when they are having what amounts to a natural conversation. 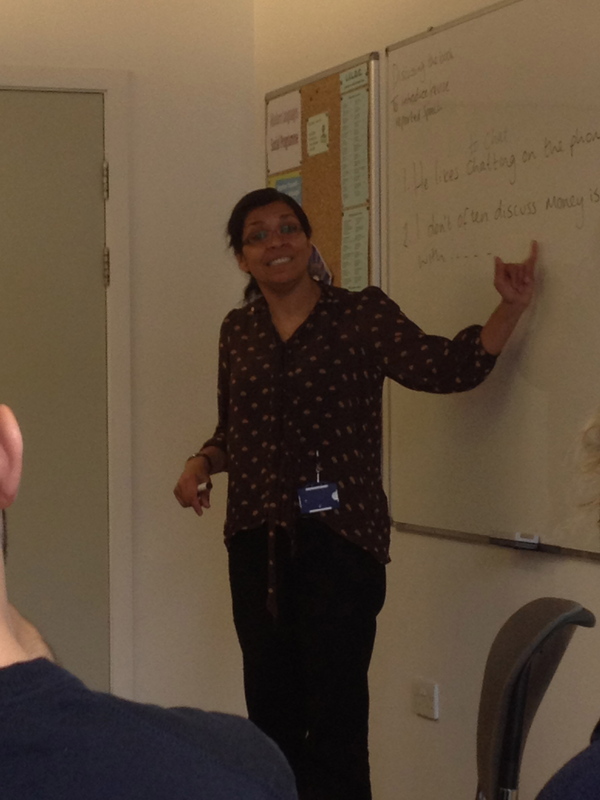 For me, the best moment of Varinder’s classes was when she demonstrated “gossiping”. She acted it out and the students completely understood her context and laughed a lot and it generated more speaking and they wrote it all down in their books. This was a spontaneous and improvised moment. Creativity and imagination at work. I had a little chat with one of the students in the break when Chia and Varinder were not in the room and I asked her if she was enjoying this ‘experiment”. She emphatically said yes, and said how interesting it was. She said she generally preferred not using the book because she speaks more without the book, and she said most importantly for her, she learns more vocabulary without the book but she said it was “necessary” and “good” to have the book for the grammar. She said she wasn’t sure why, but would think about it. For me, this was one of the best moments, hearing a student very engaged with working out for herself the best way for her to learn. Perhaps Learner Autonomy is likely to be more prevalent in a Dogme classroom because the students do not have the book to rely on – they have to work it out for themselves. The same goes for the teacher. Today’s class was to continue with yesterday’s lesson: reported speech. We had only got to the Reading task on page 70 in Global Intermediate because the students wanted to discuss the Sherlock Holmes book they had read. To conduct feedback on the teach-off. I started the lesson by explaining to the students what we would be doing today. I wanted them to understand why the final hour of the lesson was going to be focussing on feedback. I asked the students to open their books and look at page 70. They had to read the “Extend your vocabulary” information about hear and listen. Students read the first part and we went through the differences. I clarified and answered some of their questions. Students then completed the 5 sentences and checked their answers in pairs. I monitored and helped. Next I asked the students if they remembered yesterday’s reading task, which they all did. We had a brief recap of the stories before I asked the class to look at the Grammar exercise on page 71. Students referred back to the reading text and changed the sentences to direct speech – we did the first one together so that they knew what they had to do. Students worked in pairs and discussed their answers with each other. I conducted feedback and here we spent a lot of time going through the language. 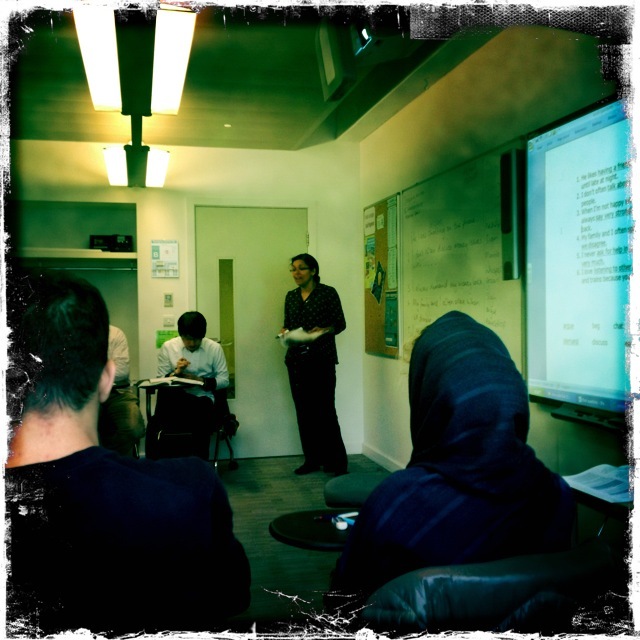 The class seemed very interested and asked a lot of questions about the rules of reported speech. There were numerous occasions during this activity when we side-tracked away from it. One such example of this was when we looked at the sentence with cheese in it. One student asked me was this the same as cheesy (something we had come across in yesterday’s lesson). I asked the class if anyone knew the difference and explained that one was a noun and the other an adjective. Students then asked for more examples of cheesy. The conversation went from the ending of the film Titanic (which I thought was cheesy!!) to cheesy chat-up lines. Students wanted examples of cheesy chat-up lines and I was able to bring these up in the IWB (which was finally working). They really enjoyed reading them and we discussed if they had this sort of thing in their languages. We moved on to the listening activity on page 71. Students had to listen to six people speaking and make notes. They then worked with their partner to report what they had heard. After they had done this, I asked them to look at page 155 of the book where the audio scripts are for the listening. Students looked at what was actually said and compared their notes. I asked them to amend their reported sentences now that they had seen exactly what had been said. In one of the listenings the speaker says “I fell over and broke my stupid ankle” which most of the class heard as stupid uncle. They found this hilarious and a lot of laughter generated from this mistake. We did quick class feedback. After the break Chia and I conducted feedback from the students about the past four weeks. We also got to show the what has been happening over the past month on Chia’s blog and I think they were pretty impressed and a little surprised that this had all been going on behind the scenes. The results? You will all have to wait for those in another post….. I have really enjoyed the past month and the especially the past two weeks when I have had the opportunity to get back into the classroom. The learners were really wonderful and responded well to what we were doing. They were also very good about having observers in their classes on a daily basis and did not allow this to affect their behaviour. Apart from the last hour of this lesson, the rest of the lesson was a little more similar to how I would normally do things – ie follow the students’ lead and not stick rigidly to the course book. It makes for a much more student centred learning environment. After finally revealing to the students what we were up to, and showing them this blog, we are finally given consent to use their pictures! 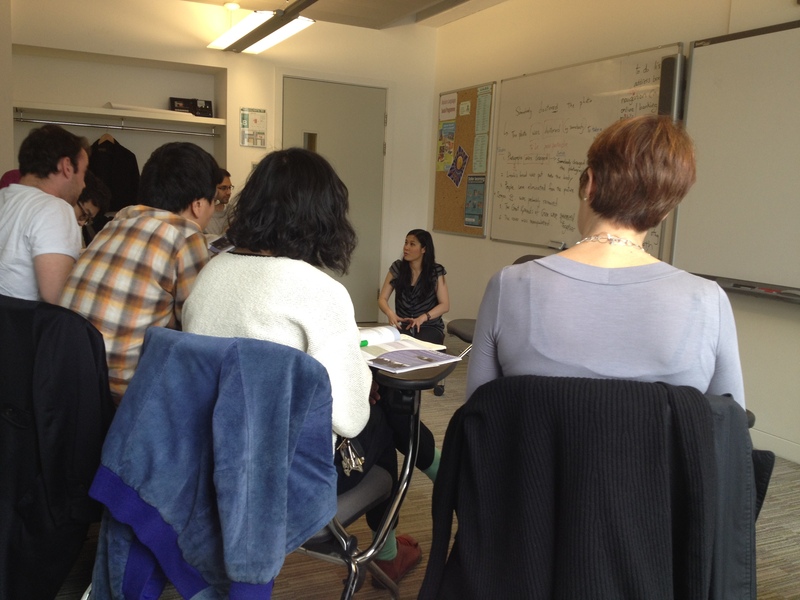 Today, Varinder Unlu goes back to using the coursebook after trying Dogme out for a day. This is Varinder’s account of her 7th Day using the coursebook. For those of you who have been following this teach-off from the beginning, you may remember that when I started two weeks ago I asked the class to pick a book to read and they choose Sherlock Holmes – short stories. We talked about the first story in one of the lessons last week and yesterday the students asked me when we would be talking about the rest of the book, so I in keeping with what the learners want – I did that today for the first part of the lesson. The class started almost on time – I was a few minutes late. 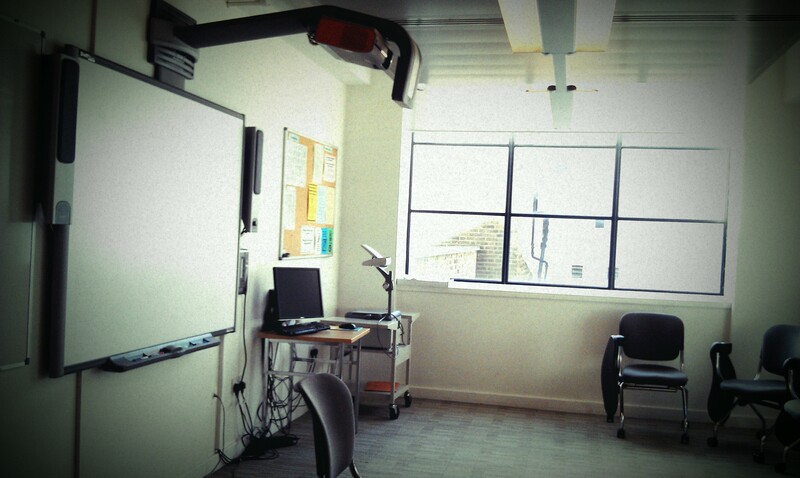 When I got to the classroom there were seven students already there. I didn’t want to start the first activity until more of the learners were there so we played “back to the board”. By about 9.15 most of the students had arrived. I divided the class into two groups and put the discussion questions (see below)up on the IWB. I went through the questions with them to make sure that they knew what was being asked of them. Did you feel that the book met your expectations? Were you disappointed? Did you enjoy the book and stories? Why? Why not? How did the book compare to other books by the author (or other books in the same genre)? What about the plot of the different stories? Did it pull you in; or did you feel you had to force yourself to read the book? How realistic was the characterization? Would you want to meet any of the characters? Did you like them? Hate them? Did the actions of the characters seem plausible? Why? Why not? How does the setting figure into the stories? Is the setting a character? Does it come to life? Did you feel you were experiencing the time and place in which the stories was set? How would the stories have been different if it had taken place in a different time or place? Did the stories end the way you expected? Would you recommend this book to other readers? To your close friend? Why/why not? The groups started their discussions and I monitored and occasionally asked questions to help things along. There some great answers to the questions. Once the students had finished their discussion we did a class feedback of their answers. At the end of this we talked again about the importance of reading especially as some of the students were saying that they had learned a lot from the book and it had helped them to see words in context. I explained that they should go to the school library and borrow more books to read and continue reading in English for pleasure. 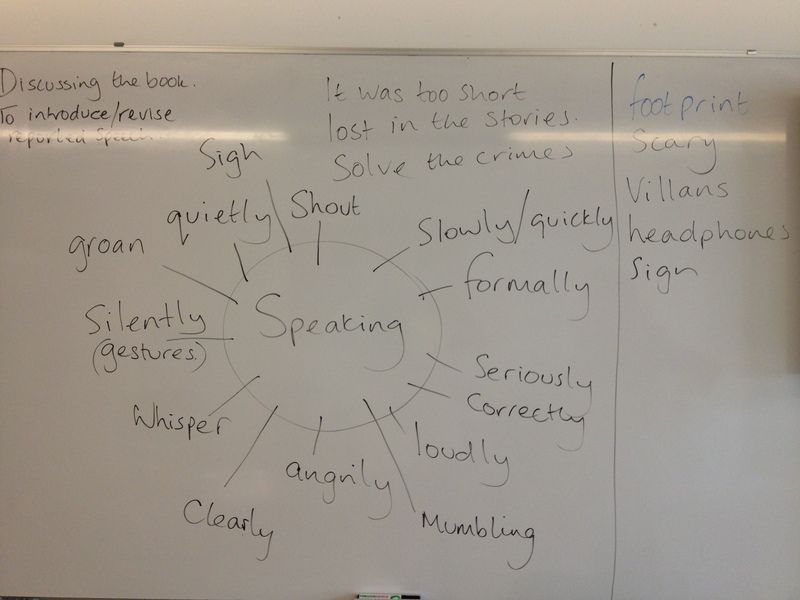 To lead into the first activity in the book (page 70) I wrote the word “speak” on the board and asked the students to discuss in pairs the different ways of speaking. 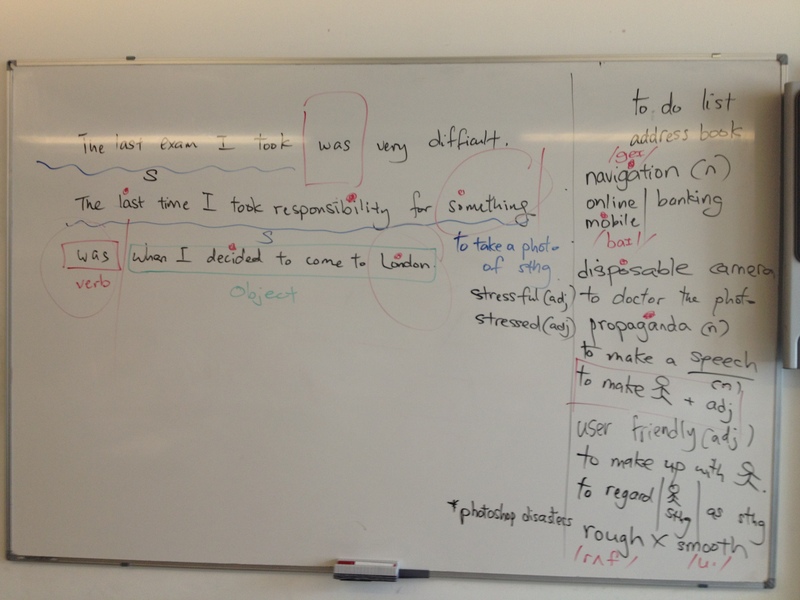 During feedback we got a lot of lovely language from the learners: slowly, quickly, loudly, quietly etc (see pic of whiteboard for rest). I then added some of the ones they had not got: whisper, sigh, mumble, groan. I drilled the language as the words were put up on the board by asking students how the word was pronounced and the picking the best pronunciation to model for the rest of the class. I prefer to drill in this way as it takes the focus away from me and there is always one student in the class who can be used to model it. I then asked the group to look at page 70 and the read the instructions for the first activity. I usually allow students to read the instructions for themselves as it is an invaluable skill for them to have to be able to read instructions and follow them – particularly important when they’re taking exams but also in their day to day life. I checked that they had understood the instructions by asking: How many people are you going to listen to? How many phrases are there? What do you have to do with the people and the phrases? I played the listening and students listened and matched up. I allowed students to check their answers in pairs and played the listening one more time for consolidation and then conducted quick class feedback. Next I asked the student to look at the words in the grey box in exercise 2 and went through the pronunciation. I then asked the students to work with their partner to explain any words they knew the meaning of and their partner did not. The students then did the activity which was to match the words up to the sentences which had their definitions in them. During feedback there were a few questions, especially as the form of the word sometimes had to change if students were to say the sentence with the word from the grey box. One was likes to chat/chatting. Students wanted to know if this could be used in both ways ie like + to + infinitive or like + verb ing. As they seemed keen know this I thought that after the break we would go through the sentences again. After the break focused the students’ attention back on the sentences and asked them to re-write them using the correct form of the word. We went through them and students were asking questions about why like and love can be followed by the infinitive with to and the verb + ing. So I gave the students the grammar exercise at the back of the book on page 148 for homework. It gives a brief explanation of verbs followed by –ing and infinitive with to. I will ask them in tomorrow’s lesson if they have an questions and will clarify if there is still confusion. We moved onto the lead in for the Reading activity. I asked the students to look at the two questions and discuss with their partner. We went through their answers briefly. Here there was confusion over overheard and eavesdrop, which we went through and also the word gossip. I then asked the students to read the conversations on page 71 and decide which one they thought was the funniest. Students discussed their answers with their partners. I conducted class feedback and went thought any problems with lexis – squirrel, pay check, salary, wages. One of the Brazilian students said that in Brazil they refer to payslip as the onion because every time you open it makes you cry!! (I thought this was really funny and so did class). Students enjoyed this activity and there was a lot of talking and asking of questions. I think because the class now know each other well and I know their different characters and a quite a lot about their personal interests, we could joke about things and everyone knew what was being talked about. Finally I went through some of the pronunciation of words and some meanings that were up in my vocab column on the whiteboard. As is often the case in real life teaching (as opposed to CELTA or DELTA observation lesson), we didn’t get to the reported speech part of this lesson. Something we will continue with tomorrow. I have been thinking about this lesson a lot, especially when students brought up the questions about like and love. Of course because the lesson focus was reported speech I didn’t want to spend too much time on this but wanted to help as well. That’s why I thought it better to give them something to do by themselves and then see if they have any questions rather than start focusing on that. I think my teaching in ESOL taught me to keep things simple and manageable so rather than overloading the learners with various things in one lesson, I feel it’s better to focus on one thing. This has worked for me and my learners in the past and I have achieved a great level of success with students by giving them manageable chunks of language to focus on. This is a lovely lesson in the Global and there’s a lot that comes out of it for the learners. 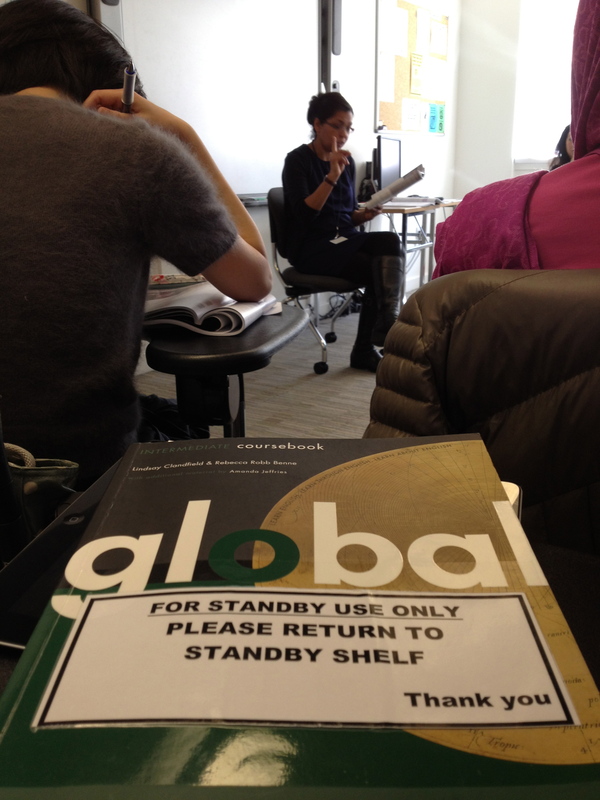 Yesterday, I had to teach with the coursebook. 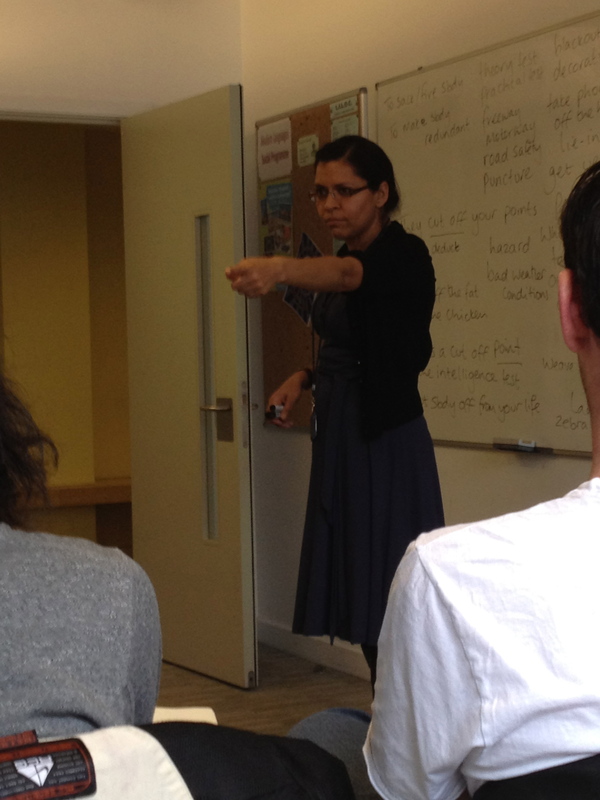 Today, Varinder Unlu’s had to teach with pure Dogme. This is her account of the events. Sticking the original rules set out by both Chia and myself, today I had to teach a Dogme lesson. The day started with me feeling quite exhausted as I had done CELTA input on Tuesday evening and didn’t finish work until 21.30 and had spent the day dealing with day to day running of the General English department. But I was not going to let tiredness stop me from fulfilling my duties. I started by collecting some dictionaries and a set of mini white boards for a vocabulary revision activity I was thinking about doing with the class in the 45 minutes of the lesson. As I entered the room, four students were already there. We greeted each other and then one of the students approached me with his CV and explained that he had been invited to an interview for a job and they wanted him to send them his CV in English. He asked if I could have a look at it and see if was ok. As I was going through his CV , other students started arriving and one of the Japanese students asked me what was happening. I explained that I was checking a CV at which he became very excited and asked me if I could do the same for him. I told him to bring it in tomorrow and we would look at it tomorrow. This all happened before 9 o’clock. I started the class by asking students what they did yesterday after the lesson. One student said he had gone to Harrods. The conversation about Harrods became about how expensive it is and one student said that he thought people had to pay £5 to use the toilets there. I could not tell the student if this was true or false as I have never been to Harrods!! The other students were also not sure if this was true or not. We moved on to what the student bought from there and he said he had bought a handbag for his mother. We talked about different departments in the store and then one student mentioned the shrine in memory of Princess Diana and Dodi al Fayed which is in one part of Harrods. She said it was kitsch and the other students wanted to know what this meant. I asked her to explain and she tried by saying “it’s the opposite of elegant”. We tried to explain with some examples and I said “cheesy”. This is a difficult word to explain unless there are some visuals and I would normally bring up a picture on the IWB to show meaning but the IWB hasn’t been working all week. I don’t think I did a very good job of explaining. Then the conversation changed as one student started talking about another big shop on Carnaby Street, near Oxford Street. I actually didn’t know what he was talking about and it took quite a while before someone said “Liberty’s”. I’ve heard of the store but have never been there either and did not actually know where it is. (I’m not a fan of big shops and department stores and generally keep away from them). The students obviously know where these shops are as they are not only students but are also tourists. The student said he likes the fabric at Liberty’s and I asked the class if they knew what “fabric” is and one student said “a place for producing things” – he was obviously thinking about “factory”. I clarified that fabric here did not mean factory and other members of the class told him what it was by pointing to their clothes and saying clothes. This moved us onto what else fabric can be used for and language emerging: sheets, pillowcase, duvet cover, blackout blinds, curtains, sponge, feathers, cotton, lie-in, get up. From a description of duvet the conversation went onto one student talking about how he likes to get up late on a Sunday morning , have a large breakfast, read a newspaper. We spoke briefly about lie-in and how many people liked to do this on a Sunday morning. I said that I don’t like to lie-in on a Sunday and get up at 6 and one student said that’s when he’s usually coming back from a party or nightclub. Here I thought the conversation was starting to (panic on my behalf?) so I started talking about someone I’d seen on the train this morning who was being selfish. 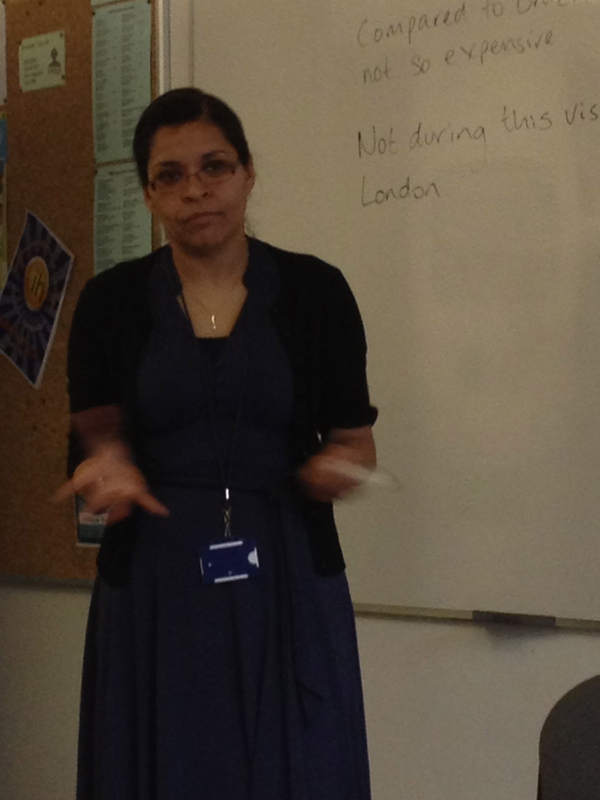 I said rude people were a pet hate of mine and tried to get students to talk about pet hates which did not happen. The conversation somehow ended up being about driving and different kinds of drivers, passing tests and getting points on licences. We discussed that in the students’ countries people have to re-take their tests after a year or five years. I eventually put the students into pairs and asked them to tell each what happens when they take a driving test. I then changed the pairings and asked the students to explain what they had learned from their previous partner. There are two students who do not drive and one of them was clearly bored with the subject and did not really want to talk about driving and anything related to it. As students were working in pairs I monitored and helped when they needed me with language or clarification and I also noted down errors and new lexis. After the pair work I tried to move onto the error correction slot but ended up explaining cut off in great detail to students because they asked different questions about its uses. After the break I put the class into two groups and each group had to choose 10 words from the last week. Each student had two words each and they had to write three definitions with only one being the correct definition and the other two being false. The students worked in their groups to choose their words and then divided them up. I monitored and helped. When they had finished writing their definitions, I gave the students a mini whiteboard each and explained that each person from the teams will read their word and the three definitions and the opposing team had to write down A, B or C depending on which definition they thought was correct. We played this game until the end of the lesson. In my own opinion this lesson, apart from the final activity was not a good lesson. 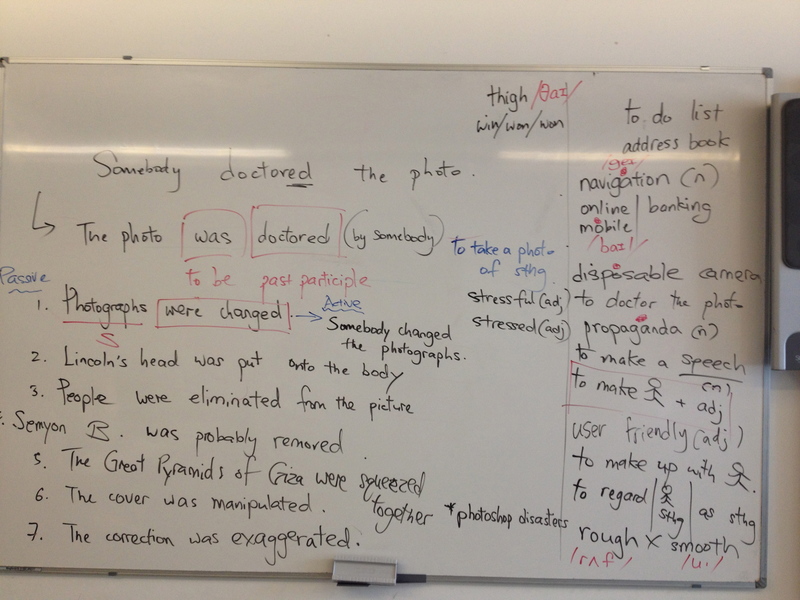 The board was covered in loads of lexis, similar to what I’ve seen in Dogme lessons (not only Chia’s, I might add) and it left me thinking about how much the learners would retain from this lesson. Of course if I was to continue teaching in this way I would revisit the language in the next lesson to consolidate but in my feeling is that it was far too much. I’m also not a fan of going into grammar terminology with students and like to keep things simple. I also felt bad about the students who had no interest in driving and didn’t really want to talk about this topic. I don’t think my learners went away with much knowledge of anything new and it left me feeling rather depressed. I hate it when I know that my lesson has been pants and not much learning was taking place. We went from one topic to another and covered about six in total because that’s where the students were taking them, I had follow. I couldn’t actually remember much of the lesson afterwards and had to really think about what happened. The above account is not entirely accurate as I still can’t remember some of the stages. This could be down to number of factors – general tiredness on my part or just too many things happening in the classroom. I think I’m my own biggest critic and am honest enough to know when lesson was not as good as I would like it to be. Overall opinion: not a successful lesson which left me feeling disappointed with the learning outcomes and very thirsty (TTT very high). Teacher-led, teacher focused, not catering to everyone’s learning styles and needs.